My copy of Little House on the Prairie is so well-loved that two entire sections of the book have fallen out. No matter; the words are all there. I wouldn’t trade that book for anything. When I finish reading each day, I stand up and go to each child on their nap mat and show them any illustrations. As careful as I am, those two sections often fall out onto the lap of a child. The children seem to understand that they represent the many years of children before them who heard the same words and reveled in the story. I think they feel included in that special group. Jaina stood up and came over to me. I smiled at her and pulled her close. Long pause. Children were processing all of this. Jaina and Ella had families from India, but they were not the same Indians in the story. Me: “Sometimes people are scared of somebody that looks different. Maybe that’s why Ma doesn’t like Indians. 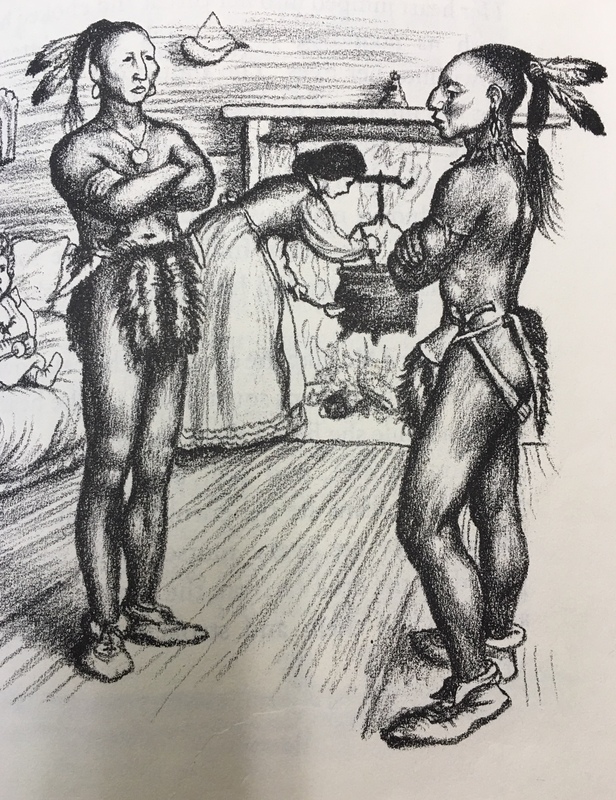 Low and behold, today’s chapter was “Indians in the House” and it helped to cement yesterday’s conversation. Two Indians came into Laura’s house, and she was scared. They were different, with darker skin and feathers in their hair. Yet, their eyes sparkled at Laura. The illustration, like Gloria, helped children to see the differences. Don’t judge a book (or person) by its cover. And so it went. I knew this spontaneous conversation was far more important than any planned lesson in diversity or acceptance. You see, the real learning begins with the child. We just have to be aware and seize those moments. This happens all the time during chapter reading. It is wonderful! This entry was posted in books, chapter reading, children's books, Diversity, Early Education, Expressing words and feelings, history, Kindness, reading aloud, reading aloud, Teaching young children and tagged chapter reading, children's books, Early Education, emergent curriculum, Indians, Little House on the Prairie, reading aloud, Teaching Diversity, teaching young children. Bookmark the permalink. Very gd way to lead in. Thank you, Ritu. 🙂 I have 15 children every day, and typically 20 each year (some children are only MWF or TTh). Okay. I have two sessions of 20 kids – mornings and afternoons. It’s hard work. Three hours isn’t long! 20! Do you have one or two assistant teachers? Our state rules say 1 to 10 ratio, but we have classes of 15 with two teachers. Yes, three hours is not long enough!! We have one teacher and 2 assistants. Ratio here is 1 to 8 for assistants and 1 to 13 for qualified teacher for our age group. Just looking at my new September intake lists too now and it’s going to be interesting…! I can’t even pronounce some of the names! Oh, no. My class will be on the young side, with a number of siblings of former students. I can’t think too much about that till this year is over. Do you have the summer off? Or, at least part of the summer? It’s enlightening in good and bad ways. We get to see living conditions and a child’s manner before they get to us which helps us get ready for resourcing come September! I’m already counting down to July! The power of Gloria aids understanding once again. She is a valuable life example for sure. She really is, Pete. Best to you. Spontaneous learning is always the best lessons. That is why I believe children shouldn’t be over scheduled. Well said, Bernadette. You are so right. What a wonderful opportunity to teach such an important lesson – good job Jennie – I think we’d all tell you to come up so we could give you a hug! I love little house on the prairie, Jennie. This is the book I had in mind when I wrote my Mom’s story. I love the story about the Indians and the papoose. What a lovely learning experience for your learners. Thank you, Sue. 😊 It is a terrific book. I’m so glad you enjoyed the story. Today’s chapter was even more powerful. Your kind words are so appreciated. It is wonderful how you make the most out of these teachable moments! I love those stories- glad to see they are still being taught. Thank you! They are the best. Thank you, Tina. I really think these lessons ‘stick’. Stay tuned for part 2, the same yet different. A lovely lesson for us all, Jennie. And there’s nothing like a book so well loved that it’s coming apart! Hugs! 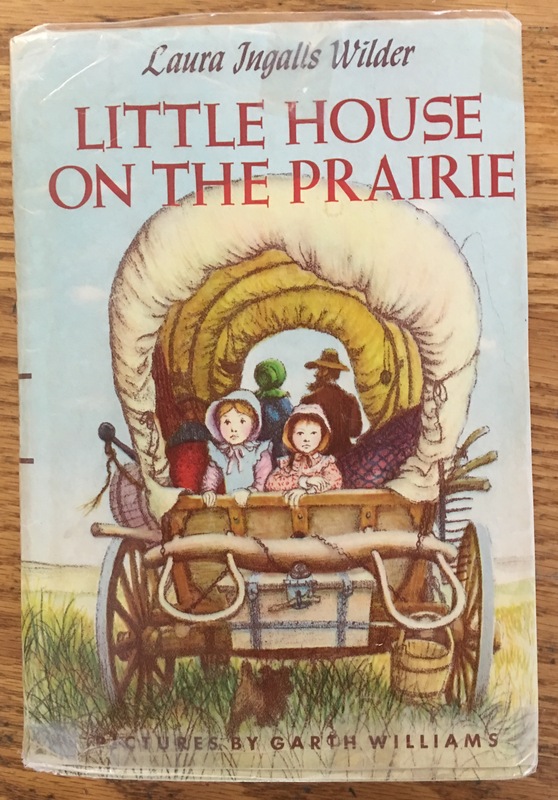 I use to love reading Little House on a Prairie. How do you pick out the books for the children to read with there being so many. Or is it already listed in the lesson plan? I would love a few. I have a children home for summer and I would love some good ideas for our read sessions before bed. Oh this is so beautiful it gives me huge huge goosebumps. I hope yall will read and share. I hope one day some teacher has a copy of my Bubba Tails From the Puppy Nursery At The Seeing Eye and that she/he has it so long that sections of the book fall out. Thank you so much, Patty. I hope someday a teacher has a well loved copy of your Bubba Tails and sections fall out of the book. That would be wonderful. Wonderful, Jennie. Yes, learning does begin with the child and it is important to seize the moments as they arise, just as you have described and shown.